This profile is online-only content from the Spring 2010 issue of SSA Magazine. Developing and implementing citywide initiatives, collaborating with Chicago departmental commissioners, bridging theory and practice, and working right across from Mayor Daley's office -- this was the summer internship experience of SSA second-year Sarah Humpal. For ten weeks in the summer of 2009, Sarah worked as a Fellow (along with another Fellow from SSA, Angela Bailey), in the Mayor's Office Fellowship Program at the heart of Chicago government. "The fellowship emphasized the connection of public policy with social work, and how policy decisions impacted the guys on the ground," Sarah said. With an SSA concentration in Social Administration, Sarah has always been interested in the interplay between policymakers and policy implementation. She graduated from Guilford College, North Carolina, in 2003 with a Bachelor of Arts in English and Philosophy. For Sarah, her studies have always been focused around social justice and its manifestation in the world. Rawls' Theory of Justice holds special value for Sarah, who finds this particular philosophy highly relevant and adaptable to contemporary social work. "Social work is not about how society should look for some people," Sarah said. "It's about how it could look for everyone." Sarah's passion for social justice led her to a five year position in a nonprofit adult literacy program called Reading Connections in Greensboro, North Carolina. It was the perfect application of Sarah's philosophical interests, and an arena in which she could see the complex dialogue between policy and social work. Between 2003 and 2008, Sarah worked in the program, observing discrepancies in race, class, gender, and income and educational attainment. "Systems often sustain these discrepancies, and social work should be about removing them. Adult education provided a means of narrowing these divisions between people," Sarah said. Given her program administration experience at Reading Connections, the School of Social Service Administration proved to be a natural fit for Sarah. "It had the strong social admin component I was looking for," Sarah said. Her SSA education, especially the core coursework, was integral in preparing Sarah for the demands of the impending summer Fellowship. From her core classes she received a sturdy background in research interpretation, writing skills, and social policy. "I learned to be succinct without losing complexity and to distill written and oral works so as to make them accessible to wide audiences," Sarah said. 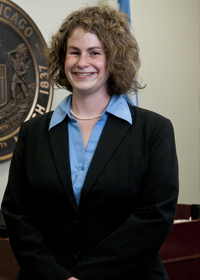 During her time at SSA, Assistant Professor Heather Hill was a powerful mentor. "She led classes that accommodated different levels of prior policy experience, eliciting conversation, critical thinking, and discussion. The research and policy background she gave me was invaluable while I worked in the Mayor's Office." It had been a mere eight months since Sarah arrived in Chicago when Director of Career Services Michael Jogerst advertised the fellowship. Given her interests, she applied immediately and was accepted for the 2009 group. Targeting graduate students interested in government, the Mayor's Office Fellowship Program offered a unique and immersive experience in municipal government. From legislation to programming, fellows engage directly with the Mayor's Office staff to learn about policy and public service in Chicago. The ten-week program included multiple components to actively involve Fellows in all levels of Chicago government. Along with her co-workers, Sarah engaged in a variety of projects across the metropolitan area, ranging from green-initiative development to public safety programming, from contending with infrastructural challenges to City-wide technological integration, and everything in between. To this end, the Fellows attended weekly meetings with commissioners to learn about the works and missions of the city's diverse departments. Fellows complemented these meetings with tours of important city sites and departmental headquarters. Every day brought a new task to Sarah's desk: traveling to O'Hare airport or visiting the Office of Emergency Management and Communications Center, meeting with the Superintendent of the Chicago Police or the Superintendent of Chicago Public Schools, and working with the Mayor's senior staff on housing policy and research. She kept abreast of the mayor's policy priorities and new initiatives as his senior staff invited Fellows to Mayor Daley's press conferences and city council meetings. She and her co-workers also attended a private meeting with Mayor Daley himself in which the group conversed in-depth about matters of government, policy, and public service. It was an ideal fit for Sarah, one of 22 selected students. "I hadn't expected the diversity in the program," Sarah said. Not only was the work multi-faceted, the group of Fellows was diverse. Only about half of the students were from Chicago, with the others hailing from across the country. No single discipline was in a majority, with Mayoral Fellows bringing backgrounds in public policy, law, business, urban planning, social work, and many other areas of academe. "My coworkers brought a lot of unique perspectives to the jobs, and their excitement and drive were contagious." After eight weeks in the fellowship, Sarah and the other fellows embarked on the final project of the program: designing a "new idea", an actionable program related to policy, public service, or any other aspect of Chicago government. Working alongside Catherine Chandler, MPP '10, a student in the Harris School of Public Policy Studies and strategic management student Anil Hurkadli, from the University of Minnesota's Carlson School of Management, Sarah developed a plan for a potential Chicago initiative: "Voluntourism: volunteering and tourism for visitors to Chicago." According to Sarah, "because of the economic downturn, more people are traveling domestically than before. American voluntourism is not as well developed as it is in other countries, and we wanted to change that. We wanted to bring people into Chicago who did not just want to vacation, but also to volunteer. Our plan was to create an office of voluntourism and to offer volunteering opportunities across the city." The team's program was grounded in its members' personal experiences over the course of the ten-week fellowship. "We want visitors to engage with the city such that they build connections with Chicago. They could leave with a meaningful investment in this city in addition to a vacation experience," Sarah said. Sarah and her team envisioned, for example, that Chicago's voluntourists could work with the Chicago Public School gardens. Through helping out in schools, voluntourists would also help students. "School gardens are excellent in an educational setting," Sarah said. "Multi-modal learning works well with students that have learning differences. It helps them foster new skills, and encourages kinesthetic learning. It helps students learn math and science skills, as well as cooperation and teamwork. All of this is enabled by voluntourist participation." Sarah was excited to learn that Chicago was awarded one of the Cities of Service Leadership grants by the Rockefeller Foundation in January of 2010. This grant helps awarded cities create a plan to increase volunteerism in the city. "The Fellowship gave me the opportunity to see and get to know the city in a truly special way. In doing research for the new idea, I got to see a diversity of opportunities for people to get involved in the city. I hope this grant allows city residents get to know new gems of Chicago and encourage their civic pride." The Mayor's Office Fellowship Program was an unrivaled experience in municipal government, social policy, and public service. Inspired by her time in this program, Sarah has already set her sights on a similar, federal program, the Presidential Management Fellowship. "I want to experience the variety of government work," Sarah said. The Mayoral Fellowship introduced me to the excitement and dedication that many municipal public servants bring to their work. I hope to sustain this drive in a position in a Chicago regional office of a federal agency." "The Mayor's Fellowship exceeded all of my expectations. It linked workers on the ground with workers in policy. I had the chance to see the multiple layers of social policy translated across levels and be engaged in that interchange."